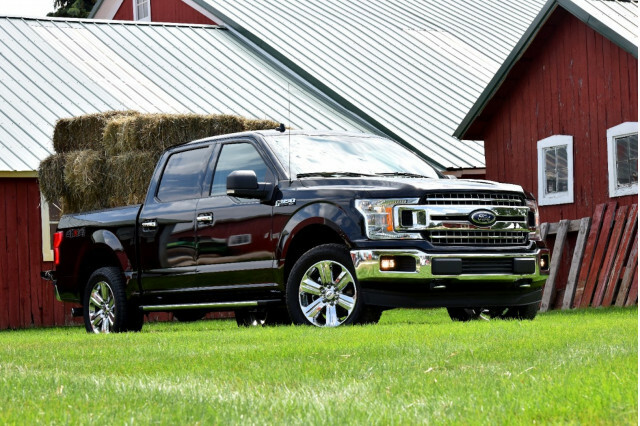 Walking into a Ford dealer and picking out a pickup truck isn’t easy anymore. The 2019 Ford Ranger mid-size truck and 2019 Ford F-150 full-size pickup overlap in more ways than some shoppers might expect. 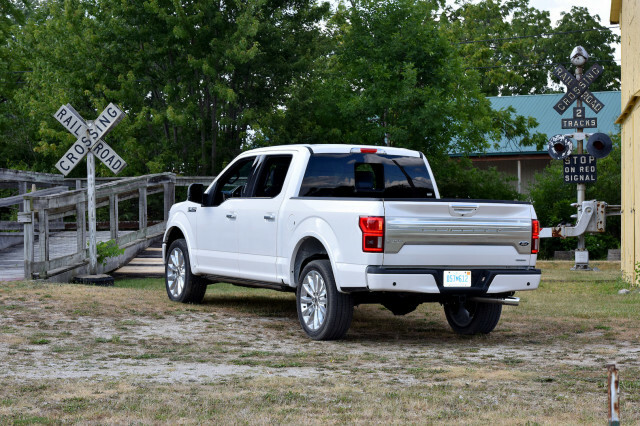 Overall, we rate the 2019 F-150 and 6.5 and the 2019 Ranger at 5.8 on our scale that rewards the bigger truck for its spacious interior and enhanced capability. The Ranger’s smaller size and more palatable price make it an excellent choice for the way most people really use their trucks, however. Ford revived the Ranger name for 2019 as a mid-size pickup truck available in extended- and crew-cab configurations. Just one engine is on offer and it’s a good one. The 2.3-liter turbo-4 puts out 270 horsepower and teams with a smooth-shifting 10-speed automatic transmission. Rear-wheel drive is standard and four-wheel drive is optional. Picking a Ranger is easy; an F-150 requires more consideration. Its lineup offers V-6 or V-8 engines fueled by gas or diesel, 6- or 10-speed automatics, rear- or four-wheel drive, and regular, extended, and crew cabs with various bed lengths. Most buyers wind up with a strong 325-hp 2.7-liter turbocharged V-6 and the crew-cab body. A four-wheel-drive Ranger is rated at 22 mpg combined, according to the EPA, versus 21 mpg for the 2.7-liter turbocharged V-6 F-150. 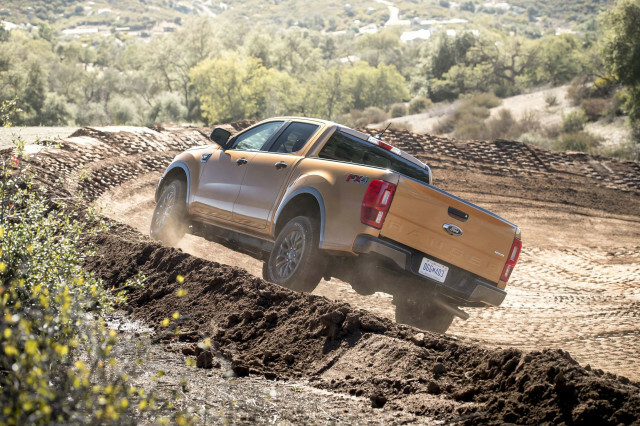 The two trucks share a transmission and their engines provide similar acceleration since the Ranger weighs around 500 pounds less than the bulkier F-150 in popular configuration. Ford rates the F-150 to tow as much as 8,500 pounds with the turbocharged V-6, 1,000 pounds more than the Ranger. Both trucks feature towing modes for their transmission, too, but those who regularly hitch up will find the F-150 a more confident hauler. Parking the trucks is a different story, however. At nearly 211 inches regardless of cab, the Ranger will tuck into average American garages with some room to spare. The 232-inch F-150 crew-cab with the standard 5.5-foot bed will probably have to spend the night outside. Urban and parking lot maneuverability is likewise compromised given the F-150’s nearly 80-inch width compared to the Ranger’s 74 inches. The Ranger’s steering is quick and its suspension is taut but not stiff, which gives it an athletic feel. By comparison, the F-150 has light steering and a soft, composed ride but hardly lends itself to spirited driving given its size. That big footprint pays dividends inside the F-150, with stretch-out space in all four outboard seating positions. 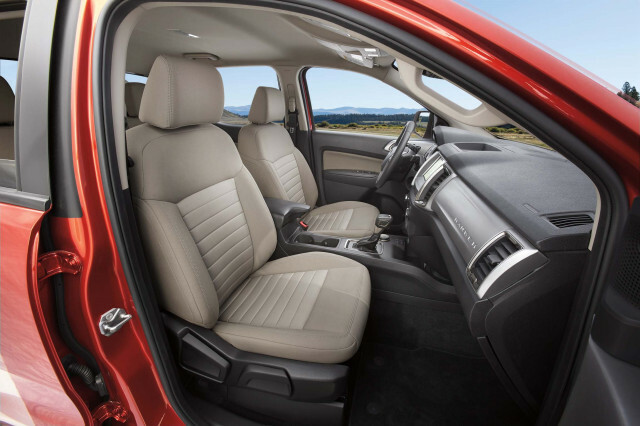 The Ranger has good front-seat room, but rear-seat riders will find limited leg room. 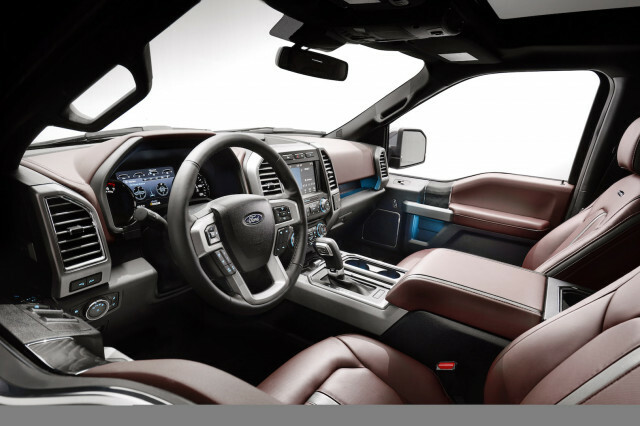 The F-150’s dashboard is dressy in high-spec trims that can cost upward of $60,000. More down-to-earth F-150 XLTs have a modern dashboard with an available 8.0-inch touchscreen for infotainment, though they’re hardly lavish inside. The Ranger’s dash is carlike, with a curvy design that stands in contrast to the F-150’s blocky design. The 2019 Ranger starts at around $25,400, but adding the crew-cab body and four-wheel drive jacks it up to about $30,000. Base Ranger XLs look spartan with their vinyl flooring and steel wheels, though they have power windows and locks, air conditioning, some active safety tech, and a 4G LTE wi-fi hotspot. Stepping up to the Ranger XLT nets alloy wheels, chrome bumpers, carpeting, cruise control, and a few other features. It’s not hard to spend $40,000 on a Ranger. An XLT with four-wheel drive and a few niceties such as heated, power-adjustable front seats keeps the price around $38,000. That’s realistically about where an F-150 starts, at least for buyers who bypass the work-oriented regular cab for an XLT crew cab. 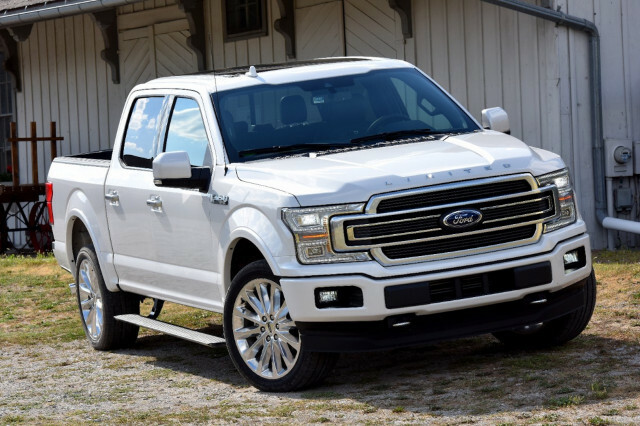 Add four-wheel drive and the turbocharged V-6, and the F-150 XLT balloons to $45,000—and that’s before you’ve worked your way through the F-150’s myriad options and packages. Surprisingly, automatic emergency braking isn’t one of those—at least on the F-150 XLT. 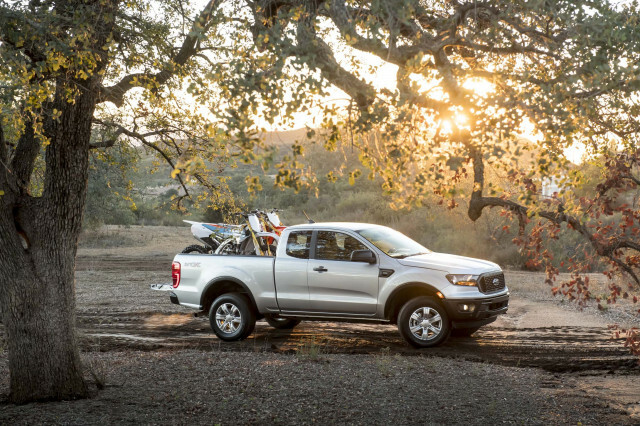 That life-saving tech is standard on the Ford Ranger, but it’s an extra-cost option reserved for the F-150 Lariat and higher trims. Adaptive cruise control is also optional on all versions of the Ranger and not available on the F-150 XLT. Overall, the Ranger gets our nod for the way most people use pickup trucks. It’s priced right, sized right, and comes with important active safety tech in every configuration. For those who truly need more, the F-150 excels among full-size pickup trucks, but it winds up feeling gluttonous against the smart Ranger.